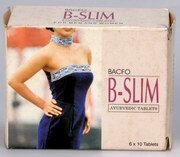 B-Slim Tablets prevent fat accumulation. It boosts basal metabolic rate (BMR), reduces BMI, so that body continuously burns calories to shed weight. It also normalizes appetite and prevents craving for sweets. It is free from side effects and can be safely consumed even by people suffering from non-complicated diabetes, high blood pressure etc. One can improve health by losing as little as 5-10 kg. 2 Tablets twice a day after meals for atleast 3 months for better results.